China Brazing is committed to being a full service supplier of brazing technical technical service and products. AnHui Huazhong Welding Manufacturing Co.,Ltd.,is located in the central city of AnHui province—Hefei. 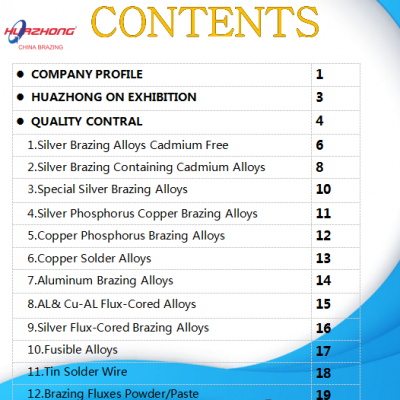 The specialty of Huazhong is engaged in the brazing material development and production of manufacturing.We specialized in this field over ten years,and have the ISO:9001-2000QUALITY CERTIFICATE.RoHS fro SGS.